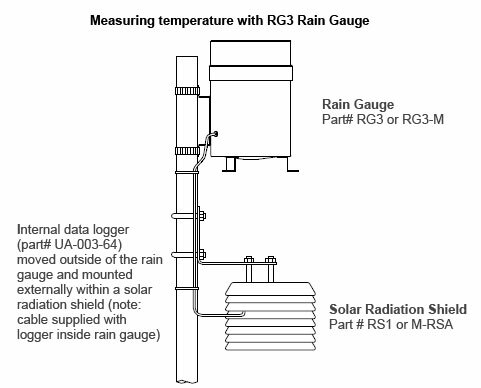 The Onset Model RG3-M Metric Hobo Data Logging Rain Gauge is a fully self-contained battery-powered rainfall data collection and recording system which includes an event data logger integrated into a tipping-bucket rain gauge. This model automatically records up to 160 inches of rainfall data that can be used to determine rainfall rates, times and duration. Order this Onset rain gauge online today! Constructed from field-proven corrosion-resistant components: aluminum housing and collector ring; stainless steel shaft and brass bearings; tipping bucket is high-precision, injection-molded, high-impact ABS plastic. Purchase this Onset rain gauge online and record up to 160 in. of rainfall at rates up to 12.7 cm (5 in.) per hour. The Data Logging Rain Gauge system is battery powered and includes a Pendant Event data logger and a tipping-bucket rain gauge. Easily collect rainfall, time, and duration data, as well as temperature when used with an optional solar radiation shield. Base station is not included and is sold separately. High quality tipping-bucket rain gauge includes a Pendant Event data logger. Compatible with Free (download) software for Onset HOBO logger setup, graphing and analysis.